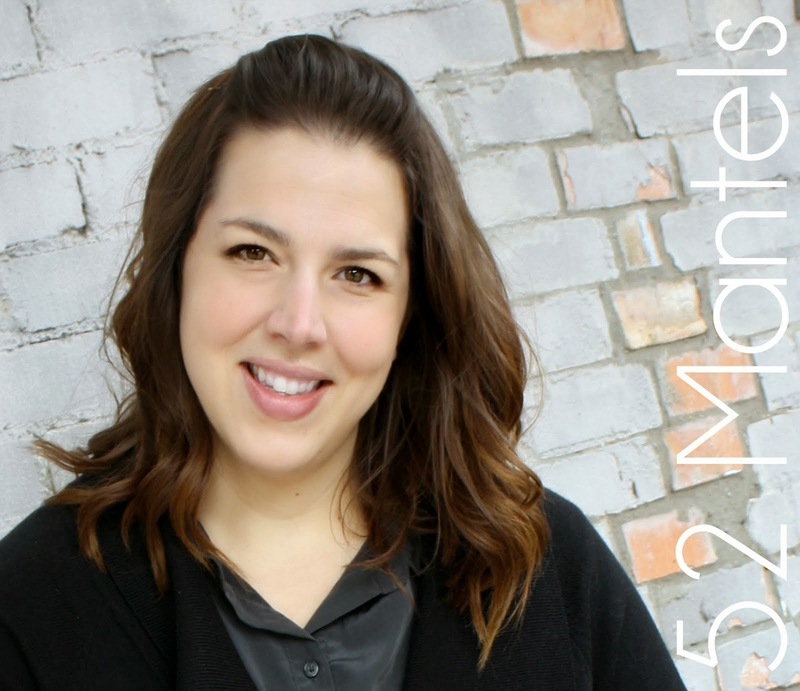 Today I have an awesome giveaway going on with Word Market and a handful of fun ladies! How does a $200 World Market shopping spree sound? Pretty great, huh? I've mentioned once or 3 dozen times that Fall is my favorite season. And, I love adding a few Fall touches to my home every year. Today, I've picked 9 of my favorite Fall finds from World Market to share with you. For me, Fall is all about rich colors (plum, teal, pumpkin!) and varying textures (wood, velvet, wool!). No, I wouldn't actually swap out my accent chair just for Fall-- but, that Pacific Blue Wingback, in a dreamy, soft velvet, is too perfect to pass up. Don't you agree? What says Fall to you? 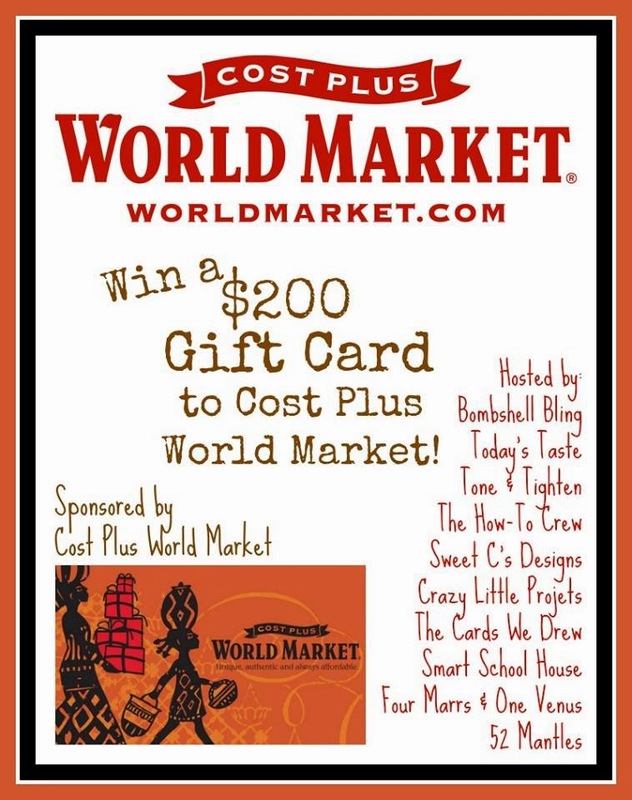 So, who wants to win a $200 World Market shopping spree?! Enter below, using the Rafflecopter. Good luck! A Fall Mantle and Pumpkin Cupcakes! All of the pumpkin recipes! I'm obsessed with white pumpkins & ghords! I love that Pacific Blue chair. So pretty! Table center pieces and sometimes even their dishes! It's super hard to choose just one thing from their store. i just got a couple of awesome tree trunks and they are perfect on my fall porch! To me, fall is here when I feel that first snap of cool air that makes me want to cozy up on the couch. I've been eyeing the pillows and throws at World Market to make my living room feel more fall-ish. That orange throw is perfect! Gourds - we finally grew our own this year. Our annual family visit to the pumpkin farm! I love new Fall decorations. My favorite fall finds are usually all the cute leaf decorations in all the great fall colors. All the cute autumn-leaves related stuff that gets put out for sale during the season. I like the pumpkin candles. Fall decor (pumpkins) from local fair. I love a cozy blanket and a pumpkin candle! Love the hammered copper tub! I loved the verde salad plates.... and fall shopping is extra fun! I love the twig cornucopias from World Market! 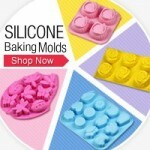 They'd make an awesome centerpiece for Thanksgiving! My favorite is number three, the wood bark pedestal stand. It would be perfect for the woodland theme baby shower I am planning for fall. I love the Pumpkin Casserole Baker. My home has more of a modern look and fall seems so rusticto me, but it might be fun or interesting to add the birch candles; I love the look of White Birch trees. The black zen cushions that were in World Market's Harvest section would fit in perfectly, but doesn't really remind me of autumn. My favorite fall finds are a soft cozy blanket and some comfort food! My favorite fall finds are knitted sweaters and argyle print! I love the velvet pumpkins I see all around blogland. To my family, fall means Halloween. We love looking at second hand shops for scary items to add to our collections. I like trying new fall recipes! I am into anything pumpkin right now! I love pumpkin pie mix and apple pie scented candles! Fall throws, pillows and yummy fall scented candles and a hot mug of cider! I found some adorable fall owl things...a platter, cups, salt & pepper shakers....super cute!! They go great with my fall decorations!! the new pumpkin english muffins! pumpkin candles and a heated blanket! LOVE, LOVE the new Wood Bark Pedestal Stand!! Quilts! First for the decorating colors, then for the cozy warmth as it get colder. New burgundy pillows for my room love that pedestal so cool. The Pacific Blue Elliott Wingback Chair looks very comfortable and I love the color. I love pumpkin and cinnamon scents. I would get some candles. Pumpkin scented hand santizer and soap! I love the Verde salad plates! I'm a visual person and love art, so what stood out to me was the painting "Magical Forest" by Alan Hopfensperger. Looking at it reminded me of the explosion of colours from the leaves and the cool gentle wind autumn brings—I'm so excited for Fall! I love to lay out orange and red decorations. Doesn't really matter what it is as long as the colors pop. I love all of the pumpkin foods that come out this time of year! I like the verde salad plates! I am in love with the wool pillow! Great way to change up a room, throw pillows! Bought new accent pillows and throw for my living room - a gorgeous yellowish fall color! Love it! I love pumpkin foods and scents. They are so good. We love the apple orchards. The fake white pumpkins that are an awesome blank canvas! Butternut squash recipes and cozy scarves. Fall is my favorite time of year. Beautiful! Im always on the hunt for the best smelling spice and woods candles during fall. Such a fun giveaway, Emily! 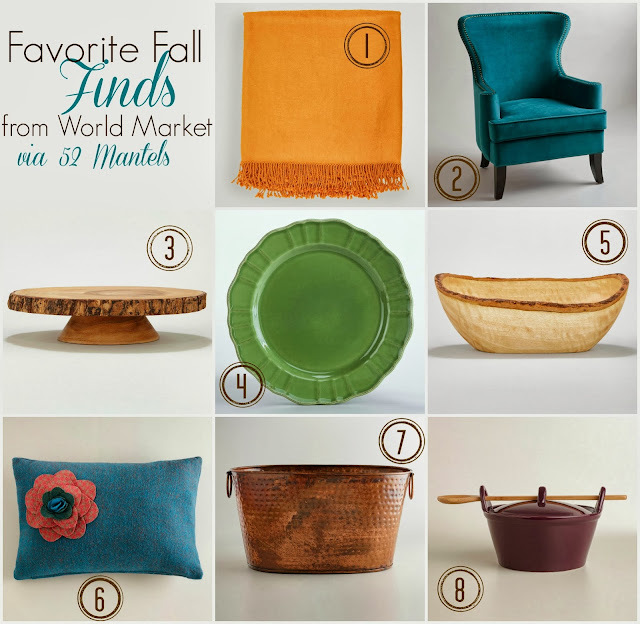 My favorite find for fall is all the beautiful throw pillows! Such a simple way to change your space seasonally. Thanks for hosting! I love the fall themed tableware and linens plus the great smelling candles that come out in the fall. I like getting the miniature pumpkins! My favorite fall finds are Honeycrisp apples when they are ready at the orchard. Candles!! Love pumpkin spice (or other Fall themed) candles in the fall!! So cozy! I love the blue wingback chair! I like when I find great fall fabrics!! I like those pretty decorative corns that you can hang on the door. Love the Pacific Blue Elliot Wingback Chair! I love the new fall candles and white pumpkins! i love some good mercury glass pumpkins! I am obsessed with Velvet Pumpkins. Fall to me is apple cinnamon and pine cones! Rich hues and blends of metallics! my favorite find for fall is new floral decors such as silk flowers. My favorite find is my Ninja cooking system, we live on soups and stews during the fall and winter. I love to put the food in and walk away, when I get home I have a nice hot dinner waiting for me. That chair is gorgeous! But my favorite find for fall is back to nature...I love creating displays or wreaths with fall things. Interesting gourds, pumpkins, autumn leaves are all fun to arrange. Owls are such cute fall finds! I like the Wood Outdoor Storage Box at World Market. http://www.worldmarket.com/product/wood-outdoor-storage-box.do? Pumpkin Spice muffins - yum! I like this look for fall. LOVE That hammered copper tub! My fall favorite is the autumn colored dishes at Cost Plus World Market. Boots! are my favorite find for fall. I love me a good pair of Boots! An apple cobbler recipe that was perfect! My big pumpkin candle I put on the center of the table every fall. Pumpkin everything - coffee, candles, decorations - love it all! In the fall, I have pretty brown clogs I wear. Because the heels of my feet will stand out, I need some nice socks. My fall finds are always pretty, funky or geometic patterned socks. I picked up a water bucket that has to be over 50 years old for sure, great find! I love the hammered copper tub you chose. I really like finding spics scented candles as well. I love the twig cornucopia for fall! I make arrangements of things like milkweed pods, cattails, dried grasses and pumpkins/gourds. Very Fall-y. I've found some great jeans. I love finding a good deal on Halloween candy and decorations. I like the Acorns, Berries and Leaves Wreath. thank you! I found a beautiful wreath at a yard sale, cheap....the best part, a little love and care from Michael's and their fall flower collection (I am not getting paid by Michael's...lol), the wreath is beautiful and I even had a MAN compliment me on it as well. I recently fell in love with a seasonal fragrance by Glade - Fall Hayride - and have it in my automatic dispenser and every time it gives off a spray, I just feel so relaxed. Fall is my favorite season! My favorite find is this gorgeous wreath for my front door made with fall eaves and mums! Scented candles of Fall like the new Spicy Orange French Candle. I like to have a nice Throw to keep me warm while Im watching a favorite movie, I like the Blue/Beige Taryn Throw. Some throws and pillows for fall. . Absolutely love the Fall items! My favorite finds are Halloween decorations. I love Halloween so much. My favorite fall find is a new way to paint pumpkins. Fall scented candles!!! Pumkin, apple pie, cranberry - love the scents!! I love the fall...I love candles that smell like autumn leaves and hay rides! Their rugs are great and the coffee aisle I go to first to see all the different kinds I can try. All the AWESOME Halloween decorations!! Apple cider recipes! My new favorite is the caramel apple cider shake! I actually just went to Cost Plus and picked up a great Fall wreath that will easily transition into December until I break out my Christmas decor. Plus it was on sale! I think i'd get that Pacific Blue Elliot Wingback Chair! I found a recipe for pumpkin chocolate chip cupcakes. My fall find would include the seasonal changes in clothing. I found a wonderful bunt orange pullover that goes with my new fall jacket. I found a beautiful wreath for my front door, its mostly cranberries and twigs. I love finding mini pumpkins in the fall for decoration! There are also new things I find that I can do with them throughout the season! I love burning candles that smell like cinnamon, apple cinnamon, pumpkin or gingerbread - all of those wonderful fall to holiday smells. The Hammered Copper Tub is beautiful!